Have you ever found yourself at the end of a performance wishing you had made a recording of it? Sometimes you hear the audio someone in the audience captured on their smartphone and it’s not bad, but it’s a bit of a letdown sonically. And it’s not just performances you’d like to record. Being able to listen back to rehearsals is a great way to help work out those more complex parts or to make sure it’s as good as it sounded when you were playing it. Let’s explore some options so that you can easily record quality audio without spending a ton of money on pro audio recording gear. We will begin with smartphones – the modern technological equivalent of the Swiss Army knife. Though remarkable, if you want to capture decent audio, especially a performance or anything capable of higher sound pressure levels, it’s going to fall short. The reason is that the on-board microphones on both smartphones and tablets were designed to capture diction and not a large or loud group. Some manufacturers, realizing this shortcoming, have created microphones that can be plugged into these devices such as the Zoom iQ5 stereo microphone which plugs directly into your device’s Lightning connector. When used in conjunction with an audio recording app, you can capture something much more pleasing than what the device’s built-in mic is capable of. 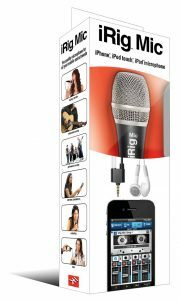 Microphone options include, but aren’t limited to, handheld, lavalier, and stereo mics. Handhelds are ideal for capturing a single source such as a voice or single instrument. Lavaliers are great for being inconspicuous but are also better suited for capturing a single sound source and are often used in interviews. A stereo mic has two elements positioned at an angle which can provide a wider soundstage. Some of these will have gain adjustments so that you can set the microphone’s sensitivity. This would probably be the best option for recording most groups. Aside from the recording device itself, the microphone should be your biggest investment. After you have selected a mic option, you will want to experiment with different locations to hear how they record. For instance, a theater is going to sound much different than a rehearsal space. Fill that theater with people, and the sound changes again. Changing a microphone’s location can have a dramatic effect on a recording. You should consider a stand to hold your recorder so that repositioning it is relatively easy. There are a lot of products on the market that can be used with a tripod, microphone or even a photographic light stand, to get your device and mic in a sweet spot. Once you’ve captured your audio, you can use the same device to edit it. You may wish to cut it into tracks or add some effects to sweeten the sound. Because there are a variety of audio editing apps available, you will probably be able to easily find something simple and intuitive to use. All together you will have a smartphone or tablet, a mic, a stand or holder for the device, and an app. A decent mic can be purchased for under $100. Stands and holders can range in price depending on how elaborate of a setup you create. Get something sturdy so that you don’t have to worry about it being knocked over when you cannot attend to it. If you budget $75 to $100, you’ll be in good shape. A lot of recording apps are free! You can absolutely invest less in a recording setup. Your fidelity needs and budget will guide your purchasing decisions, but with a little time and effort, you’ll be able to make some quality recordings! Next time, we’ll take a look at stand-alone recorders and weigh the pros and cons of using your smartphone or tablet as the heart of your recording rig. In the meantime, please feel free to let us know in the comments about your experiences or any advice you have for using a smartphone as a recording device. Mark has been with Pepper for nearly 15 years and has worn many hats – Customer Service Representative, Purchaser, Accessory & Pro Audio Editor, and Marketing Manager. A life-long drummer, he’s performed on many stages, and even though he hasn’t quite seen a million faces, he has rocked them all.